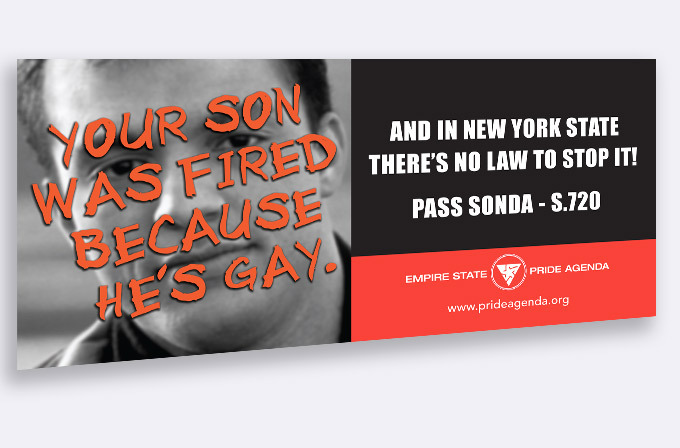 We worked with the Empire State Pride Agenda in 2001, creating outdoor advertising to help the passage of the Sexual Orientation Non-Discrimination Act (SONDA). On January 16, 2003, when New York’s SONDA went into effect, it became illegal across the state for anyone to be discriminated against in employment, housing, credit, education and public accommodations because of their real or perceived sexual orientation. This billboard was posted on the route to the State Senate in Albany, where the lawmakers who would be voting on the Sexual Orientation Non-Discrimination Act (SONDA) would pass it every day. SONDA was passed by the State Senate on on December 17, 2002, by a bipartisan vote of 34 – 26.